Open House — 4:30-6:30 p.m.
Planning Commission Work Session — 6:30 p.m. The Planning Commission initiated the code update project in 2019 and has held two work sessions to discuss potential changes. WHERE IS THE CORRIDOR COMMERCIAL (CC) ZONE LOCATED? The Corridor Commercial (CC) zone applies to various properties along Sandy Blvd. between Fairview Parkway and NE 230th Ave. Click here the see the zoning map. This zone was created in 2003 to make future development more compatible with existing residential uses along Sandy Blvd., and to support commercial activity that could serve nearby residents. The corridor commercial district is intended to allow auto-accommodating commercial development while encouraging walking, bicycling, and transit. The district allows a full range of retail and service businesses with a local or regional market. Industrial uses are allowed but are limited in size to avoid adverse effects and ensure that they do not dominate the character of the commercial area. The district’s development standards promote attractive development, an open and pleasant street appearance and compatibility with adjacent residential areas. Development is intended to be aesthetically pleasing for motorists, transit users, pedestrians, and the businesses themselves. The CC zone allows a broad range of commercial uses, including mixed-use development (housing and other permitted use), retail, office, restaurants, personal services (salons, dry cleaners, etc. ), and other commercial uses. It also allows some uses with conditional use approval, including light manufacturing, institutional/public uses (schools, parks, churches, etc.). The Development Code should be clear and predictable so that developers, community members, staff and decision-makers have a clear and consistent understanding of what uses are allowed, and the parameters for development such as setbacks, height, and building design. The Corridor Commercial zoning code is being clarified because it includes some requirements that are unclear and have led to differing interpretations. Issue #1: What is Mixed-Use? Should a minimum amount of commercial space be required? The Development Code lists all of the uses that are allowed in each zone. The Corridor Commercial code lists five broad categories of land uses that are allowed. Under the Commercial category, “Mixed use development (housing and other permitted use)” is listed. The question is how much “housing” vs. “other” should be required in a mixed-use project? Issue #2: Should residential mixed-use development be allowed in the east end industrial section of the zone? 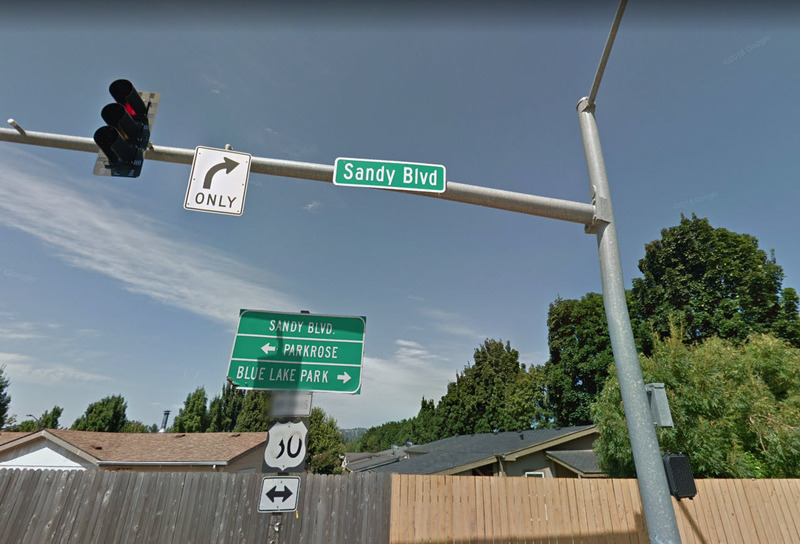 The land use policy direction for Sandy Blvd. the says that to the east of 223rd “industrial uses should dominate with some destination retail commercial near the intersection of N.E. 238th Avenue to serve nearby residents as well as the region.” (238th being in Wood Village). Most of the Corridor Commercial zone east of 223rd has been re-zoned to General Industrial, and one parcel remains in the CC zone at the east edge of Fairview. Should the same uses be allowed at this location? Should residential uses be permitted? Issue #3: Should new buildings be placed at the front of the property, near the sidewalk and street? To help create an attractive street front appearance, the zoning code “encourages” buildings to be oriented to the street, with no parking lots allowed between the building and the street. Should there be a firm requirement for the building to be located near the front of the lot with parking prohibited between the building and street?